Coworking spaces are a type of serviced office whose members are usually comprised from independent or unconnected workers or businesses. Although these offices can also be rented out by corporate clients for one company, coworking spaces generally support a shared working environment. The majority of coworking members work in an open office environment, although team and individual offices are available in the industry, only a minority of members were based in these areas in 2015. A coworking space can differ widely from location to location, for example, one space may be a floor of high rise building and another could be an entire repurposed warehouse. Worldwide there were around 15,500 coworking spaces in operation in 2017. This figure has risen from just three locations ten years previous in 2005, and is predicted to reach 18,900 by the year 2018. In 2017, the region with the most coworking spaces was Asia Pacific (including India), with 3,975 spaces, followed by the United States with just over 3,200 spaces. In the U.S., the two largest companies in terms of space leased were Regus and WeWork in the first quarter of 2016. Regus was by far the largest with 17 million square feet of office space leased throughout the United States. 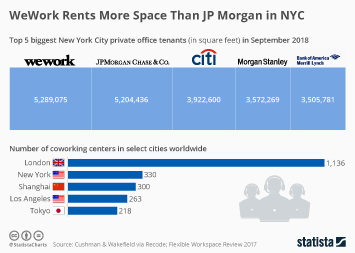 WeWork although larger than other companies was comparatively smaller than Regus, leasing approximately 4.4 million square feet. Founded in 1989 in Europe, Regus now operates in over 120 countries and 900 cities. The company offers a range of work spaces such as virtual offices, meeting facilities, corking spaces, day offices and business centers. The startup company WeWork, on the other hand, was founded in 2010 in the United States. Its primary focus is on coworking spaces with the aim to create a community atmosphere in their company. The firm operates primarily the U.S. but is expanding globally, with 11 international locations. Do you still work at your first coworking space? How do you anticipate the income of your coworking space to change in 2018? Do you plan to expand your coworking space this year? Topic: Consulting services in the U.S.
Topic: Legal services in the U.S.
Topic: Commercial property in the U.S.
Legal services in the U.S.
More interesting topics from the industry "Business Services"